Alma Rosa ground floor is composed of living room, dining, kitchen and all open up with sliding glass doors to the pool and garden. A large wood dining table sits 10 to 12 comfortably and can be made more intimate for smaller groups. This villa vacation has an exceptional mix of Mayan materials and modern style. A global flair captures the best of unique Mexican crafts. 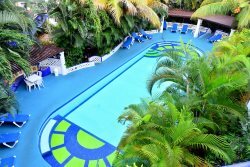 World-travelers consider this villa one of the best vacation villas on the Riviera Maya. The kitchen countertop is made of Brazilian granite, with a center island and service bar it is a great family gathering area. The Granite breakfast counter adjoins the Dining Room with a hardwood table that seats 12, people..
With four large Bedrooms and four and a half Mayan marble bathrooms en-suite, the ocean views are both wide and expansive. Bed configurations allow for a maximum of 13 guests to sleep in luxury linens. 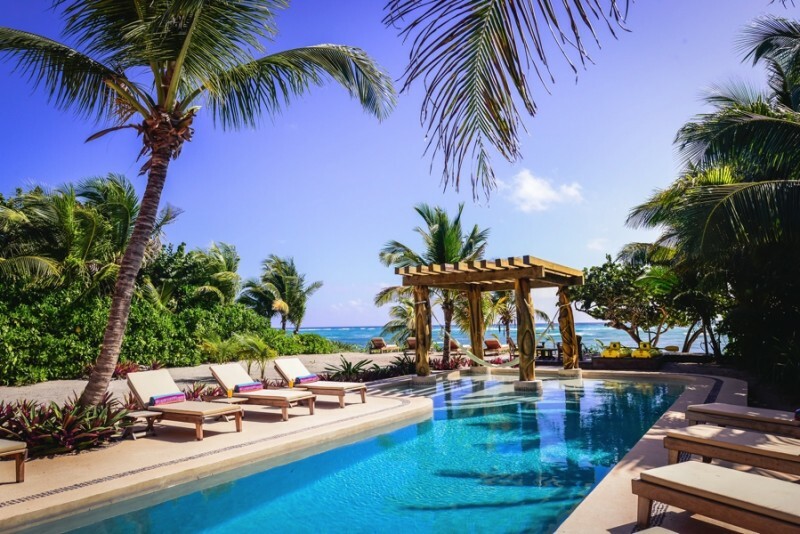 This spacious 4,000 square foot home boasts the finest of indoor -outdoor living at the beach. Ground floor includes a king sized bedroom with a single couch that can be used as a second bed. This bedroom has a large private bathroom with shower and its own shaded private terrace with hammocks, three additional bedrooms are located on the first floor all with king-size beds each with an additional bed. All bedrooms are furnished with luxury linens and have wide balconies with seating to provide direct views of the Caribbean Sea. The pool area has an outdoor shower and seating area. At night, villa Alma Rosa 2,000 square foot roof has chaise lounges. Guest Concierge greets all guests. Full-time staff lives on premises in a separate Casita. Staff services include welcome beverages; complimentary daily breakfast and afternoon Guacamole and Salsa. Pre-stocking of groceries; full chef services; private yoga teacher, massages and all local activities can be arranged and are available for a nominal charge.